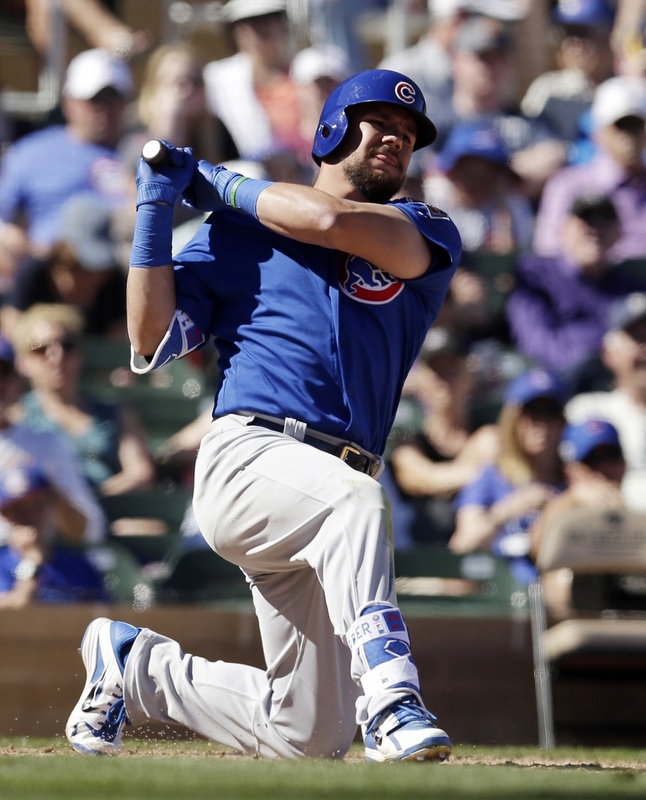 Is There a New Ceiling for Kyle Schwarber? Since he was drafted in 2014 out of Indiana, and subsequently called up in 2015, Kyle Schwarber has always represented something of a polarizing player for the Chicago Cubs. Is he a catcher or is he a DH? Can he play the outfield at an average level? Is he all power at the plate? There have always been a multitude of questions attached to the catcher-turned-outfielder. And an inconsistent 2017 season didn’t really help to answer any of those questions or quell any concerns. Schwarber’s 2017 struggles are well-documented at this point. He spent some time in Triple-A to work out some mechanical issues at the plate and, perhaps more importantly, to regain more confidence at the plate. It was a year that culminated in an average of just .211 and an on-base percentage of only .315. Of course, some of that can be attributed to a brutal BABIP of only .244 that ranked among the worst in all of baseball last year. But for many the confidence hasn’t waned in Schwarber. For certain circles, it’s been chalked up to some bad luck and a down year, one year removed from knee surgery. With his former body type, the projections were somewhat self-explanatory. Some big power and a decent walk rate combined with relatively average on-base skills and below average fielding ability. But with Schwarber potentially redefining everything that he is as a player, with winter workouts that have him thinned out and toned in a way that was never expected, did he reset expectations for himself moving forward? On the power side, probably not. Power isn’t derived from size. Power comes from mechanics, launch angle, and bat speed. There has never been any question about any of those elements from Schwarber, especially the latter element. Many scouting reports noted his elite bat speed coming into the big leagues. And with three homers already in the spring, all of which have been notable blasts, there isn’t any reason to think that the power game is going anywhere anytime soon. With all of the struggles last season, it’s easy to forget that Schwarber hit 30 bombs and posted an ISO of .256. That should be the norm moving forward. But what about the other areas of his game, particularly on the offensive side? We recently examined his potential new upside in the field, but does his new fitness change anything on the offensive side of the game? The approach has always been there, or at least the zone awareness has. Schwarber has walked at a solid rate over his first couple of years at the Major League level, with an average of about 12.5 percent between his plate appearances in 2015 and 2017. What Schwarber needs to do is cut down on the punchouts, where he went down to the tune of a 30.9 percent K-rate in 2017. Weight loss isn’t going to affect that element of his game. Schwarber has to go out and develop a stronger zone awareness that’ll help him to avoid the unnecessary punchouts and make more contact, something he only did at a rate below 70 percent in 2017 (Okay, it was 69 percent). Those elements won’t be helped by improved fitness, but his renewed focus on that side of his performance could also trickle over into his zone awareness and approach. If anything, the simplest potential change to Schwarber’s game is that of his baserunning and defense. We’ve already examined the latter, and he’s showcased much of the former this spring, with three steals to his credit already. He’s always graded out as a just-about-average baserunner, but had only posted four steals between the 2015 and 2017 seasons. With three swipes already in the exhibition season this spring, is that another tool we should add to his arsenal? Maybe on some level, but it’d be unreasonable to expect something like 25-or-so steals at this point. Nonetheless, it’s also not entirely unreasonable to expect that facet of the game to manifest itself with more regularity heading into the new season. When any player comes into the spring with a renewed focus on his physical stature, there’s going to be a reaction to it. We’ve seen it with the likes of Pablo Sandoval and others. But with Schwarber, it just seems different. Maybe it’s because he worked his way back from major knee surgery in 2016. Maybe it’s because he accepted an assignment to Iowa in 2017 like a pro and came back far stronger than he appeared in the first half of the season. Even without the weight loss, it’d be reasonable to expect a significant improvement from Schwarber’s 2017 output to his 2018. His new physique, however, completely redefines those expectations, whether reasonable or not. The power is going to be there. It’s always been there. Fewer punchouts in conjunction with a higher OBP would certainly be ideal. But an improved presence on the basepaths, combined with a stronger presence with the glove isn’t at all out of the realm of possibility. In fact, it seems all the more likely with his new workout regiment. This isn’t a situation where Schwarber has necessarily reset what his ceiling is. However, his change could absolutely represent a change in skill set, which means some potential additions to his arsenal. It could all absolutely culminate in Kyle Schwarber becoming far more well-rounded of a player than anyone had expected a catcher from Indiana to become. In the field, at the plate, on the bases. All of it. Randy Holt is a staff writer for BP Wrigleyville. He also demonstrates what little writing talent he has on the fantasy side of Fangraphs, with a focus on third base for Rotographs. A native of Chicago, Randy is a Phoenix-area resident and a high school teacher, educating juniors and seniors on the finer points of American and British literature. Which Affiliate Is the One to Watch in 2018?